I didn't get to Hickory at all last winter, so the last time I skied there was six or seven years ago, prior to their shut down in 2005. My 6-year-old son Daniel and I had the afternoon free, so we headed up to see what has changed since Hickory's re-birth last year and what's still the same. In a nutshell, all of the changes are for the better: spruced-up lodge, upgraded lifts, new terrain park. The things that have always made Hickory a fun and special place to ski haven't changed a bit: friendly relaxed vibe, natural snow, and outstanding expert terrain on the upper mountain. Winter days like this were made for skiing: comfortable temperatures in the 20s, periods of blue sky and some snow, and the ski mountain near 100% open. In the nearly 20 years that I’ve been skiing at West Mountain on Wednesday nights, I’m hard pressed to remember a year where the conditions have been as consistently good each week as they have been this year. Although it’s been about a week since the last significant snowfall, the trails we skied last night remained in smooth, dry, packed powder condition with practically no hint of any scratchiness or hardpack below the surface. The cold weather that’s been in place for just about the entire month has certainly been a big factor in keeping the slopes in such nice shape, and it looks as though favorable temperatures will remain in place. There's something intriguing about an abandoned ski area, something that makes you wonder what the area had been like and what happened to it. 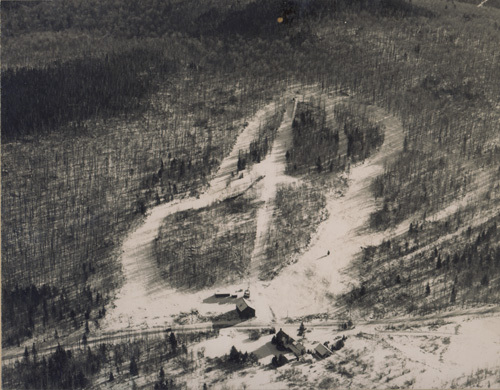 That curiosity led Jeremy Davis to found the New England Lost Ski Area Project (NELSAP) in 1998, and in the years since then his organization has documented hundreds of lost ski areas in New York, New England and elswehere. 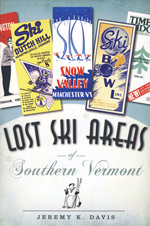 Last week I had the opportunity to chat with Davis about NELSAP and the search for lost ski areas of the Adirondacks. This past Sunday, family commitments kept us close to home. 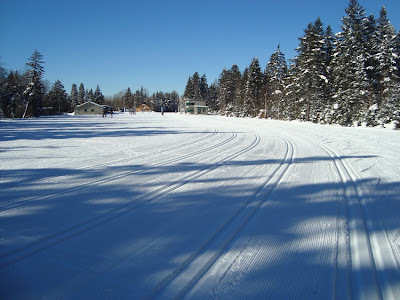 On days like that Beth and I sometimes each get in a quick nordic workout on trails near home by skiing one at a time, in shifts, while the other stays home with the kids: dual cross country ski tours. Beth did a 3.5 mile circuit of the groomed trails at the Wilton Wildlife Park and Preserve's nearby Scout Road parcel, while I opted for a woods tour through Saratoga County forestland that I can access right at the end of our block. You can read more about my tour in a guest trip report here. To find out more, contact Michele at 761-6187 or Outdoorswoman@hotmail.com. You know the mountain is in great shape when you ski all day, all over the mountain and there's still plenty that you just didn't get to. That was certainly the case today for our family, skiing from 9am till the last lift at 4 across all areas of the mountain, on the trails and in the glades. 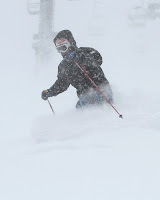 Hickory Ski Center has received almost 18 inches of snow during the last 7 days and will be opening all lifts on Saturday (1/22/2011) morning. With a powder and packed powder surface Hickory will be showcasing the best all natural snow ski and riding in the Adirondacks. Hickory is open Saturdays, Sundays and holidays from 9 A.M. 4 P.M. Complimenting Hickory's great natural snow will be added grooming from their new Winch Cat groomer that lays down some incredible corduroy for blasting the groomers and laying down perfect turns. If you're interested in playing in the Terrain Park, there are several new features to work out your best tricks. For those of you that prefer the challenges of wooded glades and steep terrain Hickory provides a unique opportunity to take some incredible runs on all natural terrain. 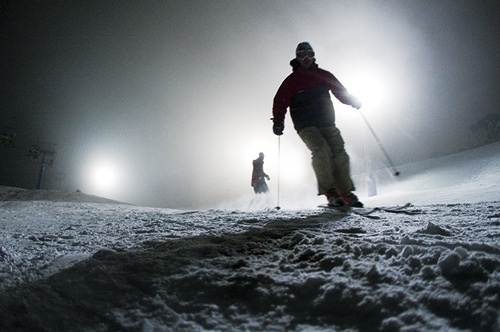 We’ve certainly had good luck with conditions for our Wednesday telemark ski nights at West Mountain this year. More snow over the past week, including 8 or 9 inches that fell on Tuesday, has extended the streak by another week. Once again, a busy parking lot and lodge at 6pm quickly transitioned to near-empty slopes from 6:30 to 9. A dozen or so of us lapped runs mainly off the triple chair until it closed at 8:30, and then squeezed in a final run or two off the double. I was having second thoughts as we pulled into the Mount Van Hoevenberg parking lot a little after 9am on Monday. The temperature in Lake Placid was minus 16 and hadn’t budged a bit on the short drive over. I had visions of not being able to warm up all day, while skiing snow that would have the sliding qualities of beach sand. It seemed I wasn’t the only one with second thoughts, as there were only four or five other cars in the lot. The short but very chilly walk from the car to the lodge did little to improve my outlook. Five inches of new snow Saturday afternoon and night improved the trails to even better condition on Sunday. And after having skied in the snow for a good part of the day Saturday, we got blue skies for Sunday. The big news of the weekend was the opening of Rumor on Friday. But whether you're an advanced skier lapping runs down Rumor or an intermediate skier cruising packed powder and corduroy, there was plenty to smile about at Gore today. Back-to-back storms and consistent cold temperatures over the past week or so have left the mountain in excellent shape. With two significant snowstorms in the past 7 days, downhill and cross-country ski conditions have improved markedly across the region and generally are in great shape for the holiday weekend. The most recent storm took a more beneficial track than originally anticipated and deposited roughly a foot of snow region-wide. Importantly, this snowfall was of higher moisture content than the previous snowfall, which helps base-building on the trails and in the woods. Some Wednesday nights are powder nights... or at least skied-up powder, which was plentiful last night at West. With schools closed because of the snow, and plenty of adults staying home too, there weren't any untracked lines to be found, but the mountain was in super shape with ungroomed powder surfaces on all trails. I would estimate around 8 inches of new snow had fallen, and fine, light snow continued to filter down for most of the evening. This snow seems to have a higher moisture content and density than last Friday's snow, which is a good thing for skiers as it will form a much better base on the trails and in the woods than the fluff from the previous storm. I've mentioned before that I've been impressed with West's ability and willingness to make snow. Despite the two significant storms in less than a week, there were still roughly 20 fan guns blowing last night. I suspect many of those have been blowing non-stop for the past 10 days, building up base depths. Since last week, about 10 guns had been moved to Midway (the trail under the triple chair) and that trail now looks ready to open. Midway is the only significant lighted trail that wasn't yet open as of last week and this week. The only thing bad I can say about last night is that all of my pictures came out blurry. I salvaged the one above. Oh well, I had said from the start not to expect many photos from Wednesday nights. Skiers from the Saratoga region may remember Alpine Meadows, the ski area located about 10 miles north of town that closed about 20 years ago. Alpine Meadows had 3 T-bars and an impressive 1,000 foot vertical drop. Alpine Meadows is just one local example of the hundreds of small- and medium-sized ski areas that have closed all over the Northeast over the past several decades. Thursday's presentation is being made in observance of the Alpine Sport Shop's 70th year in business. More information about Davis and NELSAP, some photos and a short video interview with Jack Hay, co-owner of the Alpine Sport Shop, can be found here at The Saratogian. Sometime on Thursday, a collective "Yessssssss!!!!" could be heard from skiers around the region as weather models indicated an increasingly higher likelihood of a significant snowfall that would finally benefit our region. Snow began falling Friday morning, and by noon Lapland Lake (in the bullseye) reported in with 8 inches. By late afternoon Gore recorded 4 to 5 inches, with more expected through the night. Since Daniel had his first day of Mountain Adventure at Gore Saturday morning, there was never any question about where we were going. 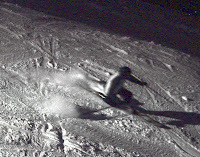 Last night I renewed my nearly 20-year tradition of skiing Wednesday nights at West Mountain, from early January into March, with my local telemark ski buddies. Our telemark group usually ranges between 12 and 20 skiers on any given Wednesday night, and a surprisingly high number have been part of the group for as long as or longer than me. Sure, I ski with these guys and gals at Gore and elsewhere, but the common element that defines our group is Wednesday nights at West. I expect to provide an update on the conditions at West for most of the Wednesday nights that I ski this winter. Sometimes we luck into a powder night, sometimes the surfaces can be scraped down to icy hardpack – just don’t expect a ton of photos. The following list isn't intended to be a comprehensive calendar of local skiing events, just a few that are on my personal calendar, in no particular order. 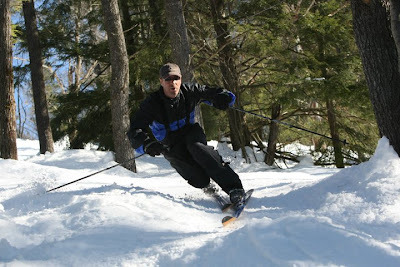 One of the events I'm looking forward to the most is the Hickory Ski Center Telemark Festival on Saturday, February 12. Hickory Ski Center, in Warrensburg, rivals Mad River Glen as a popular telemark ski destination and is known for its varied terrain, from beginner to legendary expert trails. There will be free demos of telemark equipment, and clinics to fine tune skills and provide beginners a chance learn telemark skiing.